Bruce Morgan Stampwork Bracelet size 6 1/4"
Bruce Morgan smiths Sterling bracelets without stones and characterized by deep, precise stampwork. 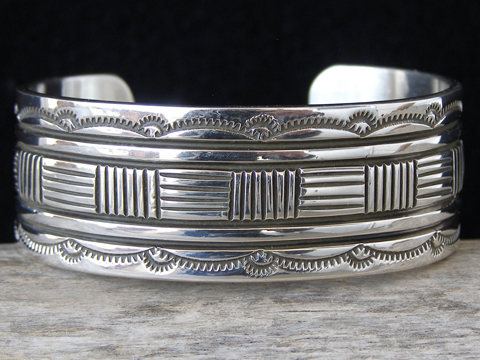 Some of his bracelets have very traditional Navajo stampwork, at other times he employs a series of straight lines which appear contemporary in design, or he mixes straight lines and traditional stamps. As with this bracelet, his preferred material is sturdy 12 gauge Sterling sheet silver. Hallmarked B. Morgan and stamped Sterling inside. Uniform width of cuff: 7/8"